where is the van der Corput sequence in base , is the asymptotic distribution function of , and , and , respectively. It is well-known that this sequence is uniformly distributed (abbreviated u.d. ), see  (2.11, p. 2-102),  (Theorem 3.5, p. 127),  (p. 41). where is the Lebesgue measure of a set . Figure 1. Line segments containing The graph of the von Neumann-Kakutani transformation . for , and , respectively, see (0.39), (0.41) and (0.46). the step distribution function (step d.f.) of the finite sequence in , while . A d.f. is a d.f. of the sequence , if an increasing sequence of positive integers exists such that a.e. on . A d.f. is an asymptotic d.f. (a.d.f.) of the sequence , if a.e. on . The sequence is uniformly distributed (abbreviating u.d.) if its a.d.f. is . Similar definitions take place for and -dimensional sequence , , in , cf. (1.11, pp. 1-60). In the sequel the -dimensional interval we denote by , where are projections on axes, respectively. These intervals are maximal with respect to inclusion. 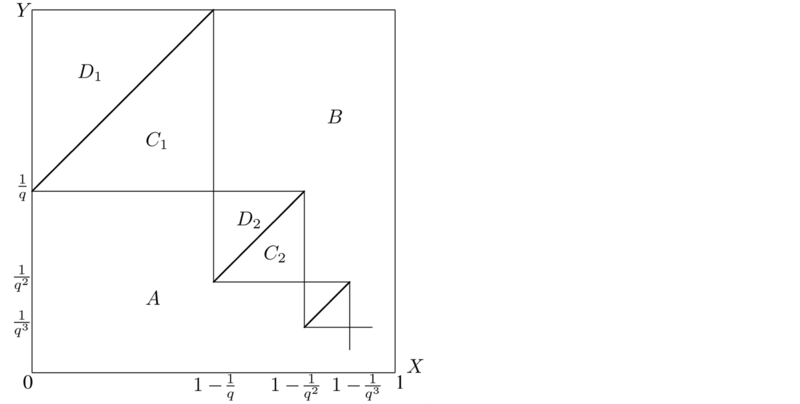 where is the projection of a two dimensional set to the -axis. and for , the mean equality misses. , and we have . Composition of the maps (0.18), (0.19) and (0.20) of forms the second iteration of the von Neumann-Kakutani transformation . The diagonals of (1.14), (1.16) and (1.15) yield the following graph of in Figure 2. Here the interval on -axis is decomposed in , , and the interval is decomposed in , . On -axis the interval is decomposed in , and the interval is decomposed in , . Note that for , the interval has a zero length and is missing. Figure 2. Straight lines containing , . Figure 3. Decomposition of the Vunit square to parts with fixed expression of . Note that for the term is omitted. where if . These intervals are maximal with respect to inclusion. Proof. Every maximal -dimensional interval containing points will be written as , where are projections of to the , axes, respectively. Moreover if then and . From u.d. of follows that the lengths . Combining intervals (1.5), (1.14), (1.15), (1.16), (1.6) of equal lengths by following Figure 3. We find (1.26), (1.27), and (1.28). Then , , , consequently . 2. Let . Then , , , consequently . 3. Let . Then , , consequently . Figure 4. Projections of intervals on axes . Figure 5. Divisions of the unit intervals. In this decomposition, for , we have possibilities. We shall order choices of from the left to the right. Detailed proofs are included only in non-trivial cases. Proof. We have , , . Then, by (1.30), . Similarly, in the following cases 2-9. Proof. We use , , . The first term is and the second is . The final equation holds if and . It can be seen that it holds also for and . For and we need to compute this sum separately. The above computation of holds for . Thus for directly follows from for if we use only such items in for which , , . These are , i.e., . The non-zero values of can also be seen in the following table. In all other cases . The knowledge of the a.d.f. of the sequence allows us to compute the following limit by the Weyl limit relation (1.1) in dimension . where is an arbitrary continuous function defined in . For computing (1.34) we use the following two methods. In the first method in the Riemann-Stieltjes integral (1.34) we apply integration by parts. if the partial derivatives exist. The differential is non-zero if and only if and in this case . Note that the same result follows from (1.44). The problems solved in this paper is significantly more complicated in higher dimensions . For example, in dimension , to compute the d.f. of the sequence , it is necessary to investigate cases analogous to cases for the explicit form in the part 0.6. Also Figure 3 would have to be converted to the dimension . Finally, we would need the third iteration of von Neumann-Kakutani transformation. The paper is sponsored by the project P201/12/2351 of GA Czech Republic.